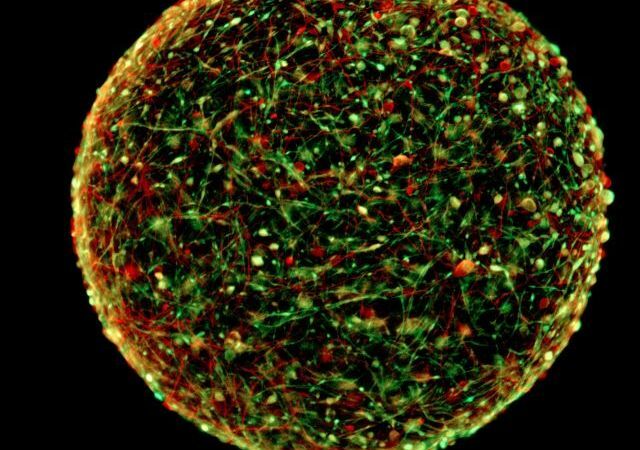 A tiny ball of brain cells may help researchers alleviate or treat neurological diseases. Incidentally, these mini-brains can be personalized depending on whose cells they come from, helping scientists study a wide variety of diseases and health problems that include Autism, Parkinson’s, multiple sclerosis, and Alzheimer’s. This new discovery could lead to a cheaper, more ethical, and more realistic model for brain research than using the brains of mice or other animals. While other miniature brains have been made that were more complex, these previous brains have been notoriously difficult to produce and work with. To produce them, they often required the use of embryonic stem cells, which are ethically ambiguous to use. Others required months to grow to a point where they could be viably used for tests. Hartung and colleagues realized that they could use adult skin cells and convert them to stem cells, using that as a base to produce the mini brain. After the production of the stem cells, the researchers manipulated the cells into differentiating into a variety of brain cells, including various nerve and glial cells. Their approach minimized the need for embryonic stem cells and allowed the researchers to easily control the extent of growth. To get the cells to form into balls, the researchers placed the cells in a shaking incubator where the cells are rolled into small spheres about 350 micrometers in diameter. All in all, the whole process takes only two months and can allow production of thousands of mini-brains all at once. Upon closer examination, the mini-brains spontaneously produced electrical activity leading to brain waves. The researchers also found that the nerve cells in the mini-brains also developed electrical insulating layers—myelin sheaths—which are made by the glial cells and needed for nerve cells to properly function. Demyelination is a common feature of many neurodegenerative diseases such as multiple sclerosis (MS). “This promises to be a fantastic model to study MS,” Hartung said. The mini-brains could be used to study autism, and the researchers have already produced mini-brains from cells of a person with Down Syndrome. This breakthrough could be useful for pharmaceutical companies testing new drugs by offering a more realistic model for pre-human trials without the need for animals. The team remains cautious however, as this method to produce mini-brains is brand new. They are currently discussing the potential of their research, and how it could be applied to the ongoing outbreak of the Zika virus. The researchers hope to have the mini-brains commercially available by the end of this year.